Believe me when I tell you I know a thing or two about being single. As a general rule, I wasn’t sad or depressed. I lived a full life–I had a lot of friends and a healthy social life. But there was something about Valentine’s Day that seemed to bring me down, no matter how content I was with my life. While the rest of the world is expressing their love to their most important person, you can’t help feeling even more alone when you’re single. Somewhere, deep down, you really are happy for all the adorable couples in the world. Still, it’s not an easy day when you’re not one of them. I get it. Remember this: Alone does not mean unloved. Just because you’re the only one who doesn’t get roses at work or a card in the mail, it doesn’t mean no one loves you. You probably know this already, but you’ve somehow managed to forget it in the midst of all the greeting card and jewelry commercials. There are people around you who love you…parents, siblings, friends, family. They may be focused on their own relationships right now, but that doesn’t mean they love you any less. They’re just distracted. You need to know that. Alone does not mean unloved. 2. God has a plan. I can see your eyes rolling now. Because, yes, that’s what I did at age 25 when someone said those words to me. It seemed so trite at the time, when I was “so old” and still single. Trust me…it’s not trite. It’s not cliché. It’s true. God sees you exactly where you are. He loves you exactly how you are. And He has a plan for you. I don’t know if His plan includes marriage. I don’t know if it includes a relationship (and yes, I know how scary that sounds right now). But I know this: His plan is the best. And just because you’re not in a relationship right now doesn’t mean you’ll never be. And, hear this: it doesn’t mean there’s anything wrong with you! It could mean He’s got something to do in you before He brings someone to you. God sees you exactly where you are. He loves you exactly how you are. This might seem a little difficult this Valentine’s Day weekend when you’re afraid to venture into public for fear of puking at the sight of another red heart balloon. But you can invite some girlfriends over to watch a movie (maybe not a romance) or play games. Or get a group together for a night out on the town. I guarantee you’re not the only one without plans this weekend. And Valentine’s Day outings are not regulated to couples only! 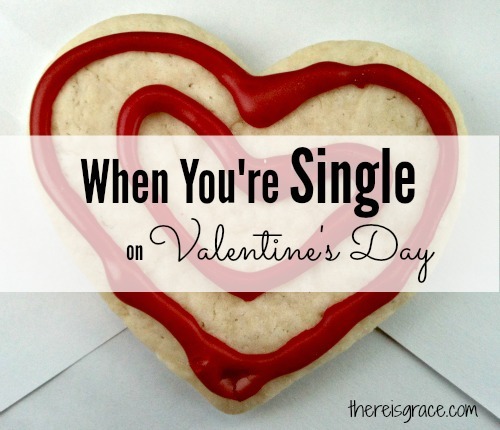 Here’s the bigger idea: Instead of pining away or growing anxious about your singleness, make the most of your time. Further your education. Volunteer. Take up a hobby. Grow your interests. Press in to know God more. In the 10 years I was a single adult, I was able to complete my education, gain valuable work experience (that’s when I seriously took up writing), lead a ministry team, participate in numerous missions trips, and travel to places like Alaska and Paris. This is where I would set down my coffee cup, lean in close, and hope you really hear me when I say, Your story doesn’t begin when you get married; you’re writing your story now. Your story doesn’t begin when you get married; you’re writing your story now. Yes, dear sister, dream about your future mate. And definitely pray for him. But don’t forget to live your life now. God not only has a plan for your future; He has a plan for your present. Great words of wisdom you shared Nancy.